This file folder game (FFG) will be as review and the students can take home. Review: Do you remember who we studied last week? They were a married couple. Ananias and Sapphira. They sold land and Ananias told Peter that the money they were giving was the full amount from the sale. But they only gave a portion. Peter told him he was lying to God and he fell down dead. After 3 hours his wife, Sapphira came in and said, yes that’s what we sold the land for. Peter said "Your husband said the same thing, so look at these men because they are the ones that carried him out when he died and they will carry you out." She died right way, and they buried her right next to her husband. 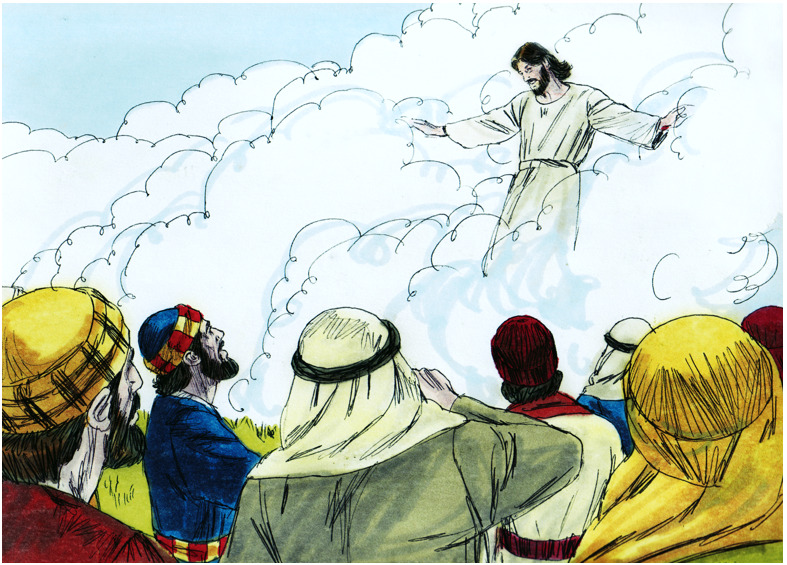 Lesson: Peter and John and Stephen were some of the people who did what Jesus commanded. They went about healing people and telling about Jesus. The high priest asked if this was true and Stephen began by telling the council about Moses and about how God delivered the Israelites. He talked about Abraham. He talked about Joseph and his father Jacob and how they were saved from the famine by God. He talked about David. Use Picture Visuals here: Moses, Abraham, Joseph and David) This is the short version, I use the long version to review Old Testament men. Insert the info at the end of this lesson for those men here. Pictures and lesson are at the end. He told the council they were stubborn, because all those people knew about God but they wanted to do what they felt like instead of what God says to do. (Acts 6:57) The men shouted out and plugged their ears! They ran at Stephen and took him out of the city to stone him. The men that were witnesses in the temple were by law supposed to throw the first stones. Those witnesses laid their coats at the feet of Saul. 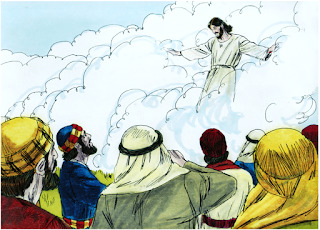 (Acts 6:58) The clothes they laid at Saul’s feet would have been the outer coat that would get in the way when they heaved the rocks at Stephen. As the people were stoning him, Stephen called to Jesus to “receive my spirit”. Stephen was ready to go to heaven with Jesus and he asked Jesus to forgive them for what they were doing to him. As we read Acts 8:3-4, we see that Saul was very destructive for the church. he went into peoples homes and dragged men & women to prison. He approved of Stephen getting stoned to death. And, those who were Christians, went everywhere preaching the word. 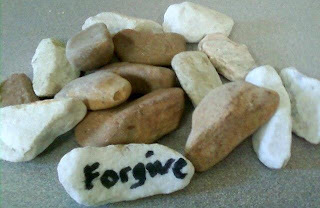 Bring Stones (I just picked these out of the decorative rock bed at the building, but they can be purchased at Dollar Tree) Let them paint or write on the stone the word “Forgive”. Talk about how Stephen forgave the men who hurt him and even asked God to forgive them. This original idea was found here. This is the front cover and inside of the FFG. The cards for each Bible man Stephen talked about are stored in the pocket on the front cover. I make my pockets for the pieces sideways, because my FFG's are stored like files, and they are carried by the kids like files, so parts do not fall out as easily. But, it's your choice how you glue it on your folder. This is a twist on a bulletin board I saw on Pinterest, but I like the FFG for review better. Here is the link to print it. If you'd rather just a worksheet, you can print it here. A. God told Abraham to go to a new land. Which he did. God promised him a son. God gave him Isaac. He would be the father of all nations. His descendants would be like the stars in the sky! Which they are! B. Then, Isaac had Jacob. And Jacob had 12 sons. We know them as the 12 tribes of Israel. Do you remember Joseph? His brothers were so jealous because Jacob gave Joseph a coat of many colors. They sold him and Joseph was taken to Egypt. God gave him "favor and wisdom". Pharaoh, the King of Egypt, made him Governor over Egypt. So he was given a lot of power in Egypt. God was watching over him! Joseph sent for his father, Jacob, during a famine, and they were able to be together again! All these men are found in the book of Genesis. C. And then Stephen talked about Moses. He is in Exodus and it's over 400 years later. (They think about 430.) God had Moses and his brother Aaron take the Israelites out of Egypt. After the 10 plagues, they left Egypt. God also gave them the 10 commandments. We will have a lesson about Moses later. D. Stephen then talks about David. He fought the giant Goliath. He was also a king for 40 years. David's son, Solomon who was the wisest man that ever lived, and was king after David's reign. E. Stephen finishes up with Jesus. He calls Jesus 'The Just One'. 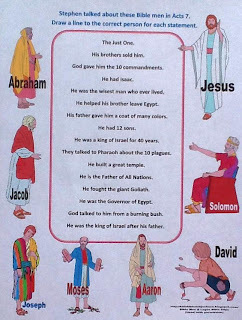 You can print the 12 Sons of Jacob here. You can print the other posters here. I used the folders today in our Sunday School. They were a hit! Thank you so much for sharing! Excellent lesson. I was a Children's director/minister for 20+ years. Loved it and sometimes still miss it. Thanks for stopping by! And, thank you for the nice comment. It's appreciated! Wow! A comprehensive set of lessons. 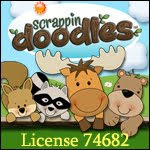 I wish I had these when my daughter was younger. Last night we watched a program which explained Christianity after Jesus on the television. My daughter still has questions...materials like yours help find answers. Thank you! Thanks for stopping by anbd leaving the nice comment! Your lessons are always so wonderful! Thank you for sharing with us at Share It Saturday! Thanks so much for visitung! I appreciate the nice comment! 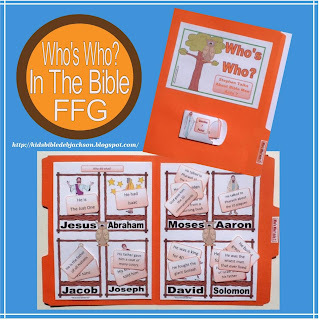 I am very interested in the FFG, Who's Who in the Bible but I'm not finding the link. 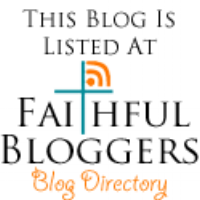 Thank you for all of the work that has gone into this blog! 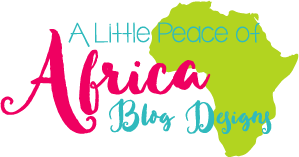 I appreciate your visits! And, thanks for the nice comment!